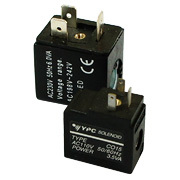 This category contains coils for YPC solenoid valves. Our coils have widths 15 mm and 22 mm and work with all YPC solenoid valves in our offer. All coils meet the requirements of CE directive. Coils are usually applied together with connector, so remember to check connectors category.